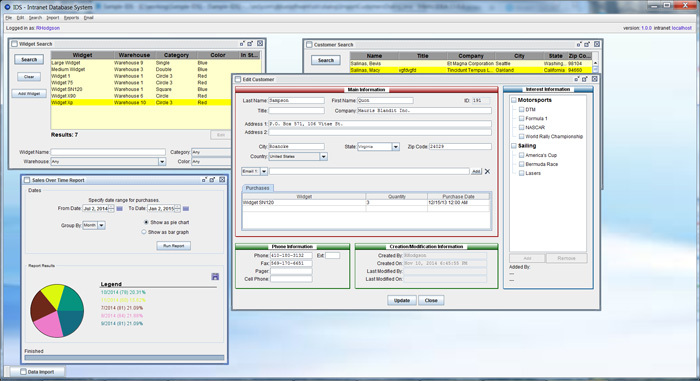 The IDS application provides the user with a multi-windowed environment. Each of these windows is displayed within a "desktop" window. This allows you to view multiple search, data or other screen types simultaneously. The desktop window displays all the user's menus, as well as other important information. This includes the name of the currently logged in user, the version of IDS being run and the addresses of the servers with which IDS is in communication. In addition, several optional floating panels are also displayed within the desktop. These monitor IDS systems providing information on memory usage, database transactions, and server status. The desktop's background can be customized with your company's logo, or other image, or the user's name.